What Is Air Washer ? Air washer is an evaporative air cooler. It cools air and reduces temperature of comfort area with the help of mechanical devices. It is an air cooling system. It produces effective cooling by combining natural process water evaporation with a simple reliable air moving system. It takes fresh air from outside of comfort area and pulled through moist pads. It cools a desired comfort area by evaporation and circulated through a house or building by a blower. There are main three sections in air washer. Filter section, cooling section and fan section. Filter section is the part of air washer. It filters fresh air from outside during suction process of air from outside to inside. It is just before of cooling section. Cooling section is the part of air washer where air is cooled and temperature of air is got dropped. In cooling section water spray is supplied by spray nuzzle. Water pump is pumping water into spray pipes. Due to continuous pumping of water into spray water pipe. Water pressure is increased in water pipe and water is sprayed in cooling section. When hot air is passed through in cooling section then temperature of air is absorbed by sprayed water and temperature of air got dropped and air becomes cools. This cooled air is pulled by blower and circulate in a house or building. Here given below is the example of air washer. Blower section is called fan section. 1. Single skin Air Washer: It is a type of air washer in which side panels are made up of only single sheet metal. 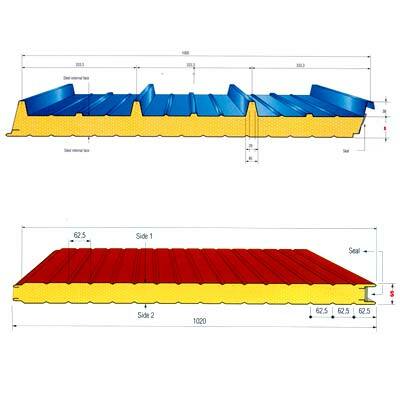 Sheet metal may be GI sheet, Steel Sheet etc. It is not using any PUF. PUF means Polyurethane Foam. Single skin air washer is cheap compare to double skin air washer. 2. Double Skin Air Washer: It is a type of air washer in which side panels are made up of Rigid PUF. Both side and both layer will sheet metal. Sheet metal may be GI sheet, Steel Sheet etc. It is using PUF between skins of panels. In below panel image used rigid Polyurethane Foam. What Are Main Components Of Air Washer ?